Includes 4 DVDs and 156 page manual. Takes a minimum of 8 hours to complete booklet and provides the diligent, self-motivated employee with the opportunity to spend much more time developing their own skills while really learning from the manual and the training process. Helps the employee develop their skills and enhance their strengths. Provides a practical way to understand the complexity of the disease and opportunity to practice the understanding using several persons for whom they provide care as examples to practice the techniques. Provides an entire section for the employee to understand more about the family and friends of the person for whom they provide care. Clearly provides the employee with the tools to positively influence their frequent interactions with these persons who are truly the providers paying customers. Entices the employee to set goals for improving their understanding and application of the care and quality of life for the person for whom they provide care. These goals provide you the employer with the opportunity for frequent interaction and training opportunities to increase knowledge with experience, reward the employee for exemplary progress and identify the areas where additional training is required for continuous improvement. 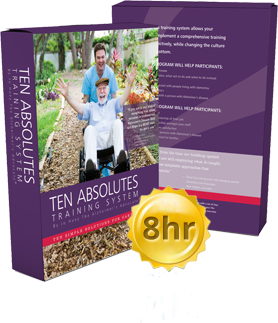 The 8 Hour Training Program Package is designed for those who wish to print their own manuals to use with the Ten Absolute Training System DVDs. Package includes 1, 156 page manual that includes 4 DVDs, PDF file and licensing agreement for manuals, and template for certificates. Includes 4 DVDs and 120 page manual. Takes a minimum of 4 hours to complete booklet and provides the diligent, self-motivated employee with the opportunity to spend much more time developing their own skills while really learning from the manual and the training process. Provides a practical way to understand the complexity of the disease and opportunity to practice the understanding using at least one person for whom they provide care as examples to practice the techniques. Provides the employee with minimal understanding of the needs of the person for whom they provide care and the opportunity to practice this knowledge with at least one person for whom they provide care as an example to practice the knowledge. 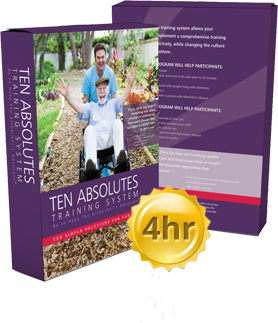 The 4 Hour Training Program Package is designed for those who wish to print their own manuals to use with the Ten Absolute Training System DVDs. 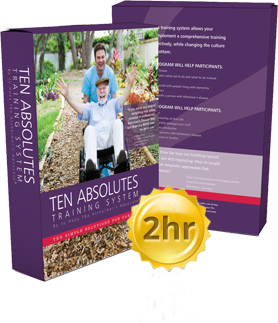 Package includes 1, 120 page manual that includes 4 DVDs, PDF file and licensing agreement for manuals, and template for certificates. 19 page guide to use while viewing DVD and a copy of Evidence of Training Completion-this is provided in a PDF file with a limited use licensing agreement for manuals and template for Certificates.